[[illegible]]... ...not have articles in the last few issues of Chanticleer. 3 for 25[[cent symbol]]. edited by Walt Leibscher. 25 Popler, Battle Creek, Michigan. Mr Tucker did have an article in the first issue of Chanticleer, a fanzine you can't afford to do without; two putrid book reviews, that were so utterly terrible that i had to print them on absorbent paper with a perforated edge so that the article could be easily removed from the magazine. Even using all these precautions, the subscription list of Chanticleer, such a gorgeous thing, too, dropped from 5 to 1 1/2. Which proves not only that Mr Tucker is bad for fandom, but that he is worse for fandom. Ah!, but this Mr Tucker is a master of subtlety and chicanery. Each year he conducts a poll, to ascertain the various bests of fandom. In these polls he inevitably ends up as No. 1 fan, and Lez, the fanzine you can afford to do without, as No. 1 fanzine. Why? Because Mr Tucker knows that the fanzine that runs such a poll has the better of the bargain, and that is why he has monopolized, or attempted to monopolize, the poll concession in fandom. He also gives away live time subscriptions to his magazine for lifetime votes. And it works, how well it works, for most fen are gullible ninnies and fall for false generosity. But, I'm glad to report that mr Tucker is failing in his ambition. Fen like myself are beginning to catch on to such diabolical schemes. Mr Tucker's articles, the few that compassionate editors continue to publish, are beginning to show the strain under which mr Tucker has been working. Yes, my friends, mr Tucker, like all would-be dictators, is slipping. No, I'll go even further with it, he has slipped. Now he is beginning to slop. 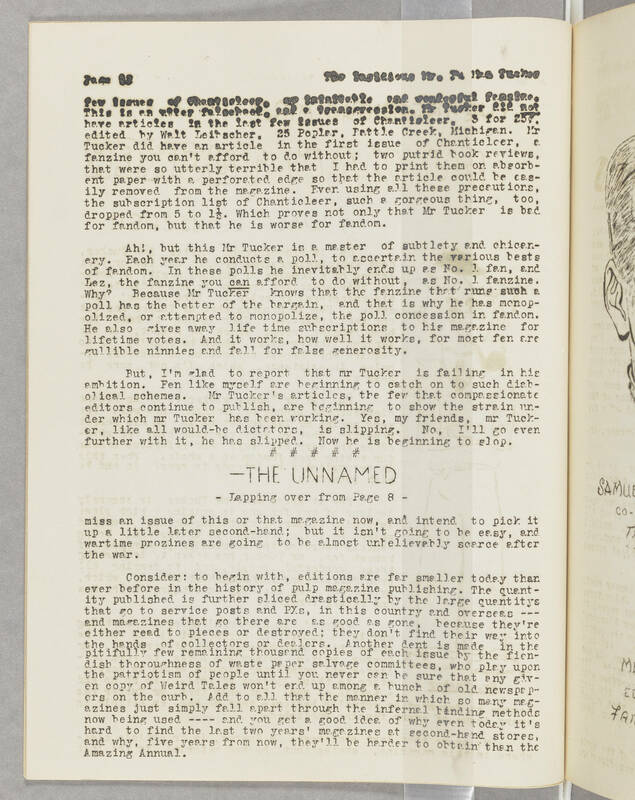 # # # # # -THE UNNAMED - Lapping over from page 8 - miss an issue of this or that magazine now, and intend to pick it up a little later second-hand; but it isn't going to be easy, and wartime prozines are going to be almost unbelievably scarce after the war. Consider: to begin with, editions are far smaller today than ever before in the history of pulp magazine publishing. The quantity published is further sliced drastically by the large quantitys that go to service posts and PXs, in this country and overseas --- and magazines that go there are as good as gone, because they're either read to pieces or destroyed; they don't find their way into the hands of collectors or dealers. Another dent is made in the pitifully few remaining thousand copies of each issue by the fiendish thoroughness of waste paper salvage committees, who play upon the patriotism of people until you never can be sure that any given copy of Weird Tales won't end up among a bunch of old newspapers on the curb. Add to all that the manner in which so many magazines just simply fall apart through the infernal binding methods now being used ---- and you get a good idea of why even today it's hard to find the last two years' magazines at second-hand stores, and why, five years from now, they'll be harder to obtain than the Amazing Annual.